Appearance: Colorless to light pink crystals. Odor: Sharp, medicinal, sweet, tarry. 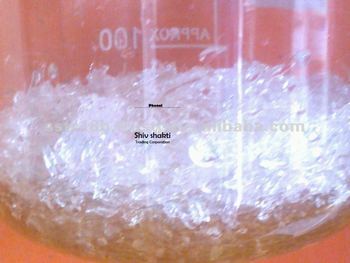 Based in Vadodara, Gujarat, Shiv Shakti Trading Corporation was established in the year 1999, with an aim to provide high quality Phenolic products in the market. With the in- depth knowledge and guidance of our owning CEOs Mr. Pankaj Athanikar & Mr.Tushar Shah, the company has achieved success within a short period of time. Infrastructure :We possess state-of-the- art infrastructure, which is well equipped with latest technology and modern machines. With the help of our robust infrastructure, we are able to meet the bulk requirement of the clients. Besides, we also have a team of experts that look into the production of various Phenolic products, so that the manufacturing process is carried out in most efficient manner. Quality Assurance :We believe in manufacturing and supplying flawless range of disinfectants products. Furthermore, series of strict tests is conducted on the products at various levels for our clients, to ensure the quality and safety of our products. Storage Facility :We have a spacious Storage Facility which is capable in storing voluminous quantity of disinfectants or Phenolic products. We provide a safe and secured storage to our products, as they are volatile in nature. Not only this, our storage facility is organized according to product categories thereby reducing chaos and confusion at the time of delivery.